It was a challenge met with mixed reactions. Charlie Cox’s challenge was seemingly simple: tell me why. 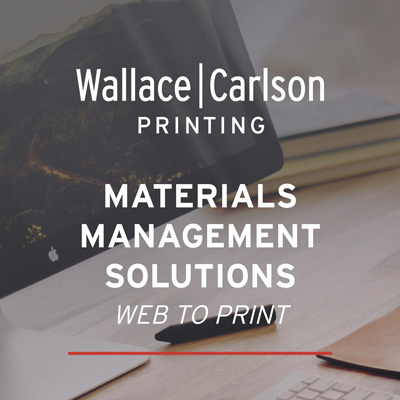 Drawing inspiration from Simon Sinek’s bestseller Start with Why, Cox, COO of the Minnetonka, Minnesota-based printer, challenged people to consider why Wallace Carlson does what it does. Wallace Carlson is a place where every person has a voice. Cox explained the ‘why’ concept and invited all employees to submit a response. His plan was to choose the one that most closely resembled his own thoughts and award a hefty cash prize. Why five winning ‘whys’ ultimately became one. Cox received dozens of great responses, so many that he had a hard time choosing a winner. We believe ink has the power to create and nurture relationships. Others see words and graphics, ink on paper. We see curiosity, smiles, conversations and brand loyalty. We see relationships. Every piece of marketing collateral, every catalog, every folding carton we produce represents the promise of a relationship between our customers and their customers. We’re inspired to look beyond the ink, and we’re passionate about helping customers form meaningful relationships. That passion fuels our ability to lead by example. We foster a culture of respect, transparency and teamwork. We listen, energize, engage and inspire. By tapping into our individual strengths and collective genius, we create value, exceed expectations and drive positive change. We’re not afraid to try new things. We challenge convention, accept no limits and dare to be different. We embrace our fundamental need to advance our operations, continually investing in new equipment and technologies that expand our capabilities, drive customer differentiation and strengthen relationships. We seize every opportunity to disrupt this age-old industry. We work tirelessly to achieve flawless execution, yet we recognize that even within the best production environments and the most seemingly perfect print jobs, there exists ample room for improvement. We never settle. We set the bar high, then we raise it, and raise it again. Our teamwork, innovation and high standards enable us to successfully apply ink to paper – but looking beyond the ink, seeing the relationships, is what gives us purpose and guides our actions.